I'm going to gloss over the awful weather, and the fact I have been laid low with some grim virus for the last 4 days. You will no doubt (if you are in dear old Blighty) be experiencing your own awful weather so let's not dwell on it. Today I want to talk to you about adapting an ancient textile technique to embellish and totally transform a plain jacket. Long-time readers of this blog will remember a post I wrote last year about Boro, the antique Japanese working clothes repaired over and over by patching with more fabric, simply by long running stitches merging the new fabric with the old. No attempt is made to turn under hems, the fresh piece just 'melts' into the ground fabric. 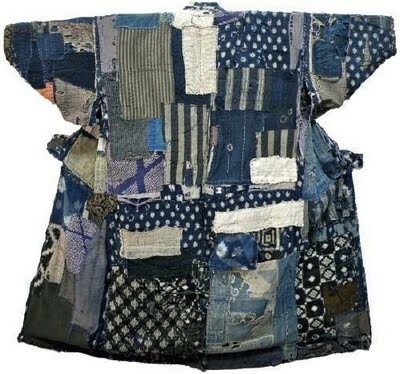 These old garments are much sought after - you can read about them in my post from May 23rd 2012 called Japanese Fabric Collection. I first read about Boro from a blogger called Jude Hill (Spirit Cloth) who has gone on to present an online workshop utilising the technique to alter a garment. My blogging friend Els, from Holland (visit her lovely blog Fiberrainbow) is taking part in that workshop and has begun work on her garment - a good quality jacket she no longer wears. Els has kindly allowed me to use her photos on my post to show you. I loved the idea from the start, and it was inspiring me to think about something I might do myself. I need a proper jacket for my Molly outfit. Currently I wear a bit of a French Tart theme with a long black cardigan .....but really could do with something warmer, and I may be changing the dress bit of the outfit as well. Something more was called for! I saw Els' jacket and was so excited! Don't you think this is going to be magnificent? This is the jacket I have....about 20 years old and counting! (and yes it does still fit!) About upper thigh length with a good swing to it. However I have a dilemma. Should I go for the traditional Boro fabrics as Els has - and I do have some Japanese and Javanese indigo fabrics, and these fabrics on the right hand side are my own hand-dyed attempts at Shiborri; I made these years ago - I should really use them up! should I go for the brightly coloured African fabrics from my collection here? Mmmmmm, think I know where I'm going with this one, don't you? The other dilemma I have is this. Boro epitomises the ethos of the 'slow cloth movement'. All stitching is by hand. The item evolves slowly over time. This is the appeal and the wonder of slow cloth. However, I need my jacket fairly soon; I don't have time to hand stitch every small piece of cloth down into the black fabric of the jacket. So I will have to use my machine, which contravenes the slow cloth ethos totally. Well, in this case, I will have to live with that. Not for me the gradual realisation of the highly textured, lovingly hand-stitched, soft-to-the-hand garment. But I should be able to produce a wonderfully patterned jacket which should do the Mollys proud. Watch this space! I wouldn't want you to think I have been neglecting my frugal-food-meal-planning-organisation drive, it's just that I've felt so grim the past few days that food has been the last thing on my mind -oh, after being organised, that is! But I want you to know that my new kitchen board arrived yesterday and I'm just waiting for Jim to return home as he is the only one between us with the energy to open the cardboard packaging! The worst thing about feeling so awful is that I had to cancel my melodeon workshop with John Spiers. Arrgh! Never mind, I know a few people who will be able to tell me all about it. Bye for now, I feel a Nanna Nap coming on! Really looking forward to seeing your altered jacket...are you going to be at the Sweeps festival in May? What a pity about your missed workshop with John Spiers...Harry did one many years ago and spoke about it for ages after [ Spiers being a bit of a hero of his]. Hi Viv, not on our agenda this year, I don't think, but I believe Ouse Washes have attended Sweeps but before my time. Yes, I'm really annoyed about missing the workshop - quite apart from having paid for it and the B&B! However OWM are performing at the Backyard Sessions with Bellowhead and getting into the concert afterwards. So I may be yet destined to meet JS himself! So anyway, I love your plans for your jacket and think the bright fabrics would work fabulously well with your hat. I hope you get better soon - these winter bugs have been so vicious this year. Boro is lovely, isn't it Wendz? I'm so annoyed I missed the exhibition in York the year before last. It seems such an exciting way to embellish something that may be very plain, or worn, or just out-dated. I take your point about machine embroidery, I have done a fair amount of very intricate free-machine embroidery myself, even taught workshops , but the slow cloth movement is just a completely different mind-set. I see no disparity in working in both ways. Yes, I think I'm going for the brights! And I am feeling better today, the tummy 'strangles' are gradually becoming less and the all-over aches have gone. Thank heavens - it has not been good! Cannot wait to see the end result! I love those African prints- I am pondering over what to do with the ones my daughter brought me back from Ghana. Love Boro- the blues are beautiful, I think I need to start collecting a stash! Hi Heather, oh, you just have to make something with your stash from Ghana! I just think this is such a great idea ...you could just do the collar, cuffs and /or pocket edgings of a jacket, or make a bag? I'm almost certainly going for the African brights. I've had a lovely time reading your blog after a blog hop here. I've never heard of this technique before but it seems simple common sense and really innovative at the same time. I think I'd go with the African fabrics. Hello Mum (I feel a bit daft typing that!!) nice to have your comments. The best blog to read to really learn about Boro is Jude Hill, she uses the technique all the time. I do agree the African fabrics seem best as they will go with my hat. Hello Sue, yes, I think the decision was made, really, when I saw the photograph of the African fabrics! And yes, I do have to get this done, time is of the essence, and I shall just have to accept that I am evolving the technique!! Lynne, those african colours would go soooo good with your hat ! Hello Els, well our snow was gone by this morning so we are very fortunate - others are not so lucky. Do you know, I am now having second thoughts about machining it! I don't have to have it totally finished before I ear it do I? I was actually going to bond the pieces first before machining so it wouldn't have been a problem, but I really think now I might just sit and hand stitch a little here, a little there.......I will let you know! Oh I love this! And I LOVE (I know I'm screaming) your African fabric. (Be still my heart!) I have a jacket I bought at the thrift store, had it altered to fit me and had planned to dye it but this sounds like a great idea. However, I do have another jacket that might work better and it's real long. Wow! Another project to add to my list. Hope you feel better soon and can't wait to see how your jacket looks. I too think the African fabrics would be grand. I love boro too and am always on the lookout for examples! Touch wood, we have both managed to avoid all the nasty bugs going around but the one you have is particularly nasty. Keep a watch on the cough if you have one as it can stay on the chest for a few weeks as bronchitis or worse. Like the idea of the jacket but unfortunately I wouldn't be able to stand all the frayed edges, got to have things lined up if possible. Maybe I ought to tackle making a jacket from quilting? Hi Dc, thanks for the good wishes. Fortunately NO COUGH, as I do readily have mine turn into bronchitis and I am floored. Er, hey-ho, I like the blues for the contrast and making the hat stand out more, but that's just me. Have never heard of Boro, but I have have farm jumpers that would qualify in the much patched (old, darned) category! Keep smiling as you mend.x. Hello Mrs! Never be afraid to show your individuality! I too love the blue ......b.....u....u....t I think I'm going with the bright. I LOVE darned and patched jumpers - in fact I have a lovely pure wool hand nit cardi which is having exactly that treatment - I've darned it with variegated heavy wool thread, and patched it with jewel-coloured velvets. Mmmmm! As I say to Cathy, above, there is a little about Boro on an old post of mine, but much better to go to Judes log and search her tags for bork - rich pickings indeed! Enjoy! I can say with my hand on my heart that my admiration for you is immense. I can't think of another job - maybe off-shore fishing - which is so dependent upon the vagaries of the weather. My (top) hat off to you, Mrs. GH, for your hard work and perseverance. The farm behind us is working away into the night often we can hear the tractors and other machinery which I have no idea about, and I don't envy them. Please retry, it seems to be alright now. Weird,man! x. Feeling tons better now, thanks Annie. Yes, firmly decided on the Africans and am getting them sorted this evening. Spring Flowers and Frugal Food.